Numerous crises were breaking out in the outerlying regions controlled by world superpowers, making populations worldwide fear the worst for their future. Here a series of symbolic exhibits, including photos and debris of the U-2 plane shot down in 1962 during the Cuban Missile Crisis, presents the key dates and protagonists of the Cold War. This is the American journalist Walter Lippmann who first used the expression "Cold War" in 1947 to define this new era, which would last until 1990. 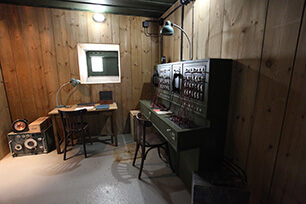 Everything began in March 1946 with Churchill’s speech in Fulton (USA) – evoking an “iron curtain” separating East and West Europe – and ended in this room with the Soviet invasion of Afghanistan in 1979. Thirty years during which countless political and military crises broke out across Europe, Asia and Africa. A very crowded room overflowing with information and events, the main crises of which were: the Berlin Blockade in 1948, the Korean War in 1950, the two crises of 1956 in Budapest and Suez, the construction of the Berlin Wall in 1961, the Vietnam War in 1964 and the Prague Spring in 1968. The Prime Minister of the United Kingdom gave a speech on 5 March 1946. “From Stettin in the Baltic to Trieste in the Adriatic an iron curtain has descended across the Continent… I do not believe that Soviet Russia desires war. What they desire is the fruits of war and the indefinite expansion of their power and doctrines… From what I have seen of our Russian friends and allies during the war, I am convinced that there is nothing they admire so much as strength, and there is nothing for which they have less respect than for weakness, especially military weakness.” Fulton, Missouri, 5 March 1946. The Cuban missile crisis in October 1962 led the two superpowers to the brink of nuclear war. It was during the Cuban affair, particularly the Missile Crisis, that the Cold War, now the “hot” Cold War, almost sparked a new World War. 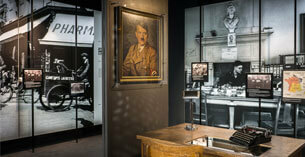 This is why the Caen Mémorial dedicated a specific space to it. On 27 October 1962, at the peak of the Cuban Missile Crisis, an American U-2 spyplane along with its pilot, Rudolf Anderson, was shot down over the island. The next day, Kennedy and Khrushchev, on the basis of a real power struggle, narrowly avoided nuclear confrontation. Three pieces of sheet alloy from the plane, kept at the Museum of the Revolution in Havana, are now on display at the Caen Mémorial museum. With the aerial photographs taken by an American U-2 plane on 14 October 1962, showing the installation of Soviet Missiles on Cuban soil, a broadcast of the private conversation between President Kennedy and the Commander in Chief of the US Air Force on 19 October extolling the attack, and Kennedy’s televised speech on 22 October calling international public opinion to witness, the visitor can follow all the key stages of this Cuban Missile Crisis, a paroxysm of the Cold War. The confrontation in Vietnam was one of the most serious crises of the era. In memory of this major conflict, certainly the most deadly of the Cold War, which erupted between the US and North Vietnamese forces, a mural showcase exhibits the uniforms of two fighters: the heavily equipped one of an American GI and the lighter, simpler one of a Vietcong soldier, complete with rubber sandals. Through shocking images, an archive film reminds you of the key moments in this 16-year war that would end in 1975 with the fall of Saigon and the Communists’ victory. 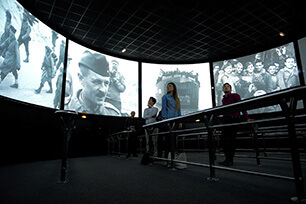 In this new room with a deliberately enclosed atmosphere, photographs, maps, films and soundtracks bring the defining moments of this period back to life, while the walls of pulleys, gears and chains recall the relentless spiral of the war of the blocks.